Cockhaven probably derives from Anglo-Saxon Caec = made up way, i.e. with soil or tree trunks, and Ven =Fenn or marsh. The way across the marsh. The word is early found as Cocven. The settlement of Cockaven was early composed of several families; it was not until early 1800’s when a single house can be found. The Paddon family were the occupiers of Cockhaven for over two hundred years. As well as the Manor House, there was also the farm. The farmyard stood where The Orchard is now, the farm house is further along Cockhaven Road near the row of cottages. 1588 The will of John Babbe was proved 16 Jan 1558, that is 1599 by present reckoning. He was John Babbe of Cockaven. 1569 The Baptism Register records the baptism of Nicholas Paddon, the son of John Paddon of Cockeven1. 1572 The Baptism Register records the Baptism of Margerye the daughter of Thomas Paddon of Cockevev. 1574 The Burial Register records the burial of Peter Paddon, son of John Paddon of Cockeven. 1577 The Marriage Register records the marriage of Peter Paddon of Cocken unto Peternell Lutton the sister of Mr Lutton, gentleman. 1577 The Marriage Register records the marriage of Thomas Paddon at Cockeven and Isett Westaway. 1591 The Marriage Register records the marriage of Thomas Babbe of Cockeven to Margerye Easton. 1593 The Marriage Register records the marriage of John Corneline to Margerye Paddon, daughter of John Padden at Cocheven. 1596 The Burial Register records the burial of John Paddon, the elder of Cockeven. 1603 The Marriage Register records the marriage of Nicholas Paddon of Cockafen to Margerie Hellier. 1611 The Marriage Register records the marriage of Thomas Avenante to Joane Paddon of Cockven. 1615 The Burial Register records the burial of John Paddon of Cockven. 1645 The Burial Register records the burial of Deborah, the daughter of William Paddon of Cockeven. 1645 The Burial Register records the burial of Roda the daughter of Richard Paddon of Cockeven. 1645 The Burial Register records the burial of Richard Paddon of Cockeven. 1658 An Indenture of sale to Sir Roger Hill includes land in occupation of John Paddon of Cockaven. 1670 The Marriage Register records the marriage of John Paddon of Corraven and Margery Cornelline. 1673 The Churchwardens’ Account has an entry relating to John Paddon of Corraven. 1674 The Baptism Register records the baptism of Thomasin daughter of John Paddon of Corraven. 1685 The Burial Register records the burial of Hanah, the daughter of John Paddon of Cockaven. 1691 The Burial Register records the burial of John Paddon of Cockaven. 1694 The Marriage Register records the marriage of John Symons of Kenton to Thomasine Paddon of Cockeven. 1697 The Marriage Register records the marriage of Joseph Nill and Mary daughter of John Bickford of Cockeven. 1697 The Burial Register records the burial of Mark Braker of Cockaven. 1702 John Paddon of Cockhaven was churchwarden this year. 1706 The Burial Register records the burial of Susannah wife of John Bickford of Cockhaven. 1707 The Marriage Register records the marriage of John Paddon of Cockheven and Susannah Matterface. 1708 The Baptism Register records the baptism of John son of John and Susannah Paddon of Cockven. 1709 The Burial Register records the burial of John Bickford senior of Cockeven. 1713 The Burial Register records the burial of Mark Brecker of Cockeven. 1736 The list of Sir John Lear’s debts after his death shows that John Paddon was one of his tenants at Cockhaven. 1750 John Paddon of Cockhaven was churchwarden this year. 1752 The Baptism Register records the baptism of Peter, son of Jno. and Mary Paddon of Cockhaven. 1786 A Parish Document shows that William Inons is apprenticed to Thos. Ewans. 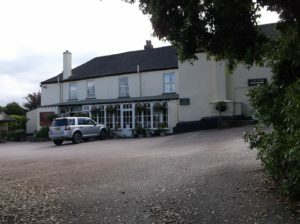 yeoman, for Cockhaven estate. 1797 The Burial Register records the burial of Thomas Ewen, of Cockhaven aged 37. 1805 The Land Tax Assessment shows that Edward Medows pays tax for the first time for Cockhaven. He had been living at Finsons (Higher Green) in 1795. He improved the old farmhouse has moved the farmer to a new farmhouse towards Shute Hill. 1810 Edward Medows died as recorded in the Exeter Paper and the Burial Register. He was the brother of Sir W Medows, General. 1821 The Burial Register records that his wife died. His niece inherited the property lady Mary Stephens and her husband, Henry W Stephens. 1836 The Tithe Map records Henry W Stephens as the owner of Cockhaven. 1847 The Burial Register records that Lady Stephens was buried. 1850 White’s Directory shows Henry William Stephens as the occupier of Cockhaven. 1851 The Census shows Henry William Stephens, half-pay Army Captain as occupier with 8 servants. The Census names John Underhill aged 49 in possession of Cockhaven Farm, 76 acres. 1857 Directories show Henry William Stephens in occupation at Cockhavn until he died in 1857 as recorded in the Burial Register. The Property was inherited by his son William who died 1864 aged 52. 1866 Kelly’s Register records that Reverend Sydney M Scroggs occupied Cockhaven. He may have been a son in a law of Henry William? 1873 Morris’ Directory shows Rev Sydeney M Scroggs in residence. The Burial Register records his burial in 1893 aged 68. 1883 Kelly’s Directory shows John Chandler in occupation. 1890 White’s Directory shows Mrs J Chandler in occupation. She died in 1892. 1897 Kelly’s Directory shows John Henry Bailey in occupation. 1914 Kelly’s Directory show Edward Stephen Cope J.P. in occupation. 1919 Kelly’s Directory show Edward Stephen Cope J.P. in occupation. 1920 The Baptism Register records that Edward Victor Cope of Cockhaven was baptised. 1926 Kelly’s Directory shows that Dr Colston Wintle J.P. was in occupation. Between the World Wars the house was used as a sanatorium.1. 1935 Kelly’s Directory shows that C F Radmore was the proprietor of the Cockhaven Manor Hotel as he was in 1939.